I’m always on the lookout for restaurants that have good food at affordable prices, but I don’t have much luck when it comes to Japanese food as most places tend to be a) cheap but mediocre, or b) good but expensive. Beatrice, Velda and I were craving for Japanese food after our meeting with the folks from Intel and Toshiba, so we went to Liang Court, also known as little Japan in Singapore. While walking around, we chanced upon Yayoiken, a new Japanese Restaurant at the entrance of Meidi-ya supermarket. After having lunch there, I’ll go so far as to say that my hunt for a place that serves inexpensive and good Japanese food has ended with Yayoiken at Liang Court. The menu ranges from Saba Shio set ($9,9); to Tonkatsu set ($13.9); and Gyu Yakiniku set ($16.9). We took a long time to look through the menu as there were so many things that we wanted to try. We eventually ordered Wafu Hamburg set ($14.9), Tonkatsu set ($13.9), Tori Katsu set ($14.9), Katsu Don ($11.9), and Gyoza ($4.9). The Tonkatsu was outstanding. The pork was crispy, juicy, and tender. Definitely one of the better Tonkatsu I’ve had, and let’s not forget that it is only $13.9. (Places like Tampopo and Tonkichi have good tonkatsu, but they are charging almost $30 for the premium grade.) This is going into my list of best Tonkatsu restaurants in Singapore. The Katsu Don, Wafu Hamburg and Tori Katsu were also pretty good. There’s really nothing you can pick on when they are serving decent Japanese food at such affordable prices. 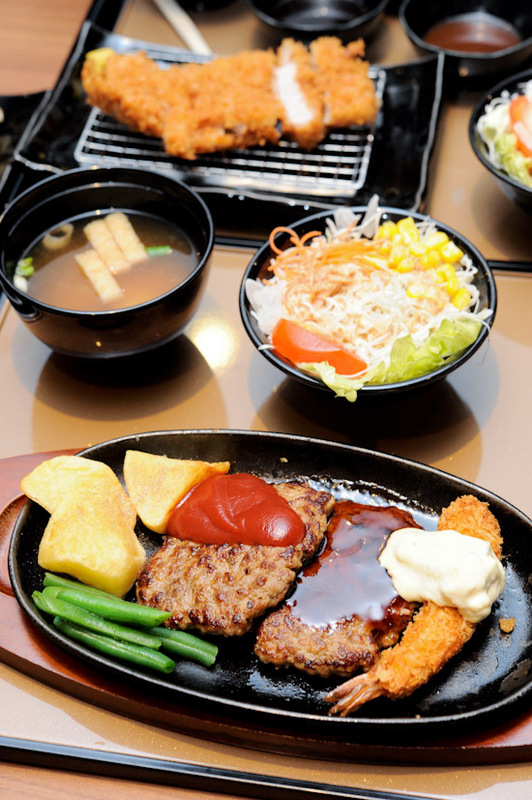 Yayoiken restaurant at Liang Court Shopping Mall offers surprisingly good Japanese food. I honestly believe that it will give Japanese casual dining restaurants like Watami, Ootoya and Waraku, a run for their money. This is one place that I will definitely go back again. Not all of the Japanese restaurant can make the authentic flavor of their cuisine, some yes but seems overprice. I think this restaurant somehow good, from your photos it looks tempting. I wonder is there any authentic japanese street food around here? This Yayoiken is good! I totally agree with you when you said “my hunt for a place that serves inexpensive and good Japanese food has ended with Yayoiken at Liang Court”. I also chanced upon it one day when I was supposed to go to Tampopo. We ended up eating here in the end because the menu looked good, and the prices were so affordable too! The one that was really memorable was the hamburg steak set. It was delicious! Decent serving too! For 5 of us plus 2 side dishes, we paid $100 (average of $20/pax). There was free flow of rice too! I was really impressed that we could find good food at such a decent price. Highly recommended! Looks really good. definitely going to try it out this week!